This section is for those who have their own vehicle or have rented a car. I have laid out 2 or 3 scenic routes to follow. This page is in progress and I will add more detail later, but I wanted to get it on line before the main summer season started. All drives start from the main intersection of Georgia & Burrard Downtown. Direction in Vancouver is relatively easy provided the weather is clear, simply remember the mountains are to the north. I am, of course, assuming you do have a road map. While this tour takes you through Stanley Park, I would suggest you allocate a day to walk through the Park if you have time. Proceed West on Georgia Street and into Stanley Park, exit onto Stanley Park Drive to your right near the Park Entrance. The body of water on your left is Lost Lagoon and to your right is Coal Harbour and the Royal Vancouver Yacht Club. Shortly after turning off on Park Drive you will see signs for Vancouver Aquarium on your left. A stop here will take up about 1.5 hours of your time, but the Aquarium is well worth the visit. Proceed along Park Drive, Coal Harbour is now on your right and you can see the sails of Canada Place and the cruise ship port ahead across the harbour. The road curves around the headland and you get a view up the harbour with Second Narrows Bridge visible in the distance. The road continues on around and Lions Gate Bridge and First Narrows come into view. The log structure you pass to your left is called Lumberman's Arch, a monument to the industry on which British Columbia was built. Past Lumberman's Arch, the road travels uphill in a series of switchbacks and eventually crosses the causeway, carrying traffic across Lions Gate Bridge. Just past this is Prospect Point, which is worth a stop to admire the view. The wealthy neighbourhood of West Vancouver is visible across the water. Continuing on the road winds through stands of Douglas Fir until the water once again becomes visible. If you exit to your right at this point, a small side road takes you down to 3rd Beach, the nicest beach in the Park. A fairly short walk along the seawall to your right will take you to Siwash Rock. Park Drive now continues back towards the the Park exit. On your right is Second Beach and a little further on, you exit into the residential West End, with 1st beach on your right. Continue along the waterfront following Beach Avenue until it reaches a Y-intersection with Pacific Avenue next to a stand of Small Palm trees on your right. Stay on the left hand fork (Pacific Ave) and follow it to Burrard Street and turn right onto Burrard Street Bridge. Cross Burrard Street Bridge and take the left hand fork at the end of the Bridge and continue up to the first major intersection, which is 4th Ave. Turn right on 4th Ave and continue along it for several miles until you end up entering the grounds of the University of British Columbia. (4th Ave was Vancouver's Haight-Ashbury and the site of the hippie scene in the 60's). Be careful to take the left hand fork in the road at Discovery Ave. as you pass a large Park on your right. The beaches you see to your right, you will pass on your way back. As soon as you enter the University Grounds, 4th Avenue becomes Chancellor Blvd. Follow this until it intersects with Crescent Road and SW Marine Drive. A short distance past this intersection is the Museum of Anthropology which is worth a visit if you are interested in West Coast Indian Culture. You need to allow 40 min to an hour to see this facility. After leaving the museum turn left onto SW Marine and follow it along the bluff as it becomes NW Marine Drive. You will now past several of Vancouver's better beaches, Spanish Banks, Locarno and Jericho. At the end of Jericho Beach the road takes a sharp turn to the right and becomes Discovery Ave. It then intersects 4th Ave where you have already been. Turn left onto 4th. Follow 4th, with the park on your left. At the end of the park turn left and follow Wallace a couple of blocks to Pt. Grey Road. If you miss it, take Alma Street instead. Turn right on Pt. Grey Road. Follow Pt Grey Road past the expensive estates on your left. Pt Grey Road eventually becomes Cornwall Ave. and to your left you will pass Kitsilano Beach. This is probably the nicest of all the Vancouver beaches. Continue along Cornwall onto the Burrard Street Bridge again and back downtown. Proceed West on Georgia and into Stanley Park. remain on the main Causeway and cross Lions Gate Bridge. At the end of the Bridge, follow the sign for North Vancouver and exit off to the right onto Marine Drive. Proceed about a mile along Marine Drive and turn left onto Capilano Road, the first major intersection. Proceed up Capilano Road and pass underneath the freeway. About a mile past the freeway you will see signs for Capilano Canyon Suspension Bridge. If you want to pay and see this, go ahead, but I would just settle for Lynn Canyon which is free. Just past the suspension bridge on your left, is Capilano Park Drive. At the end of this road is a Salmon Hatchery which you may find interesting. Allow about 30 minutes. Continuing up Capilano Drive there is a turn off to Cleveland Dam to your left, at the point where Capilano Drive becomes Nancy Greene Way. Its worth walking across the dam with its view of Capilano Canyon on one side and the lake on the other. (which happens to be the main drinking water supply for Vancouver). Continuing up Nancy Greene Way, you arrive at the parking lot for the Grouse Mountain Skyride. If it is a clear day, its worth riding this, despite the expense. Allow an hour to an hour and a half. After the Skyride, retrace your steps back down Capilano Road. Take the left hand turn immediately after passing under the freeway, this is the east bound freeway entrance. Proceed along the freeway to the Lynn Valley Road exit which is located just after the freeway takes a turn to right, exit here and proceed east along Lynn Valley Road to the intersection with Peters. This is about a mile past the McDonalds you will see on your left. Turn right on Peters, which is a Y-intersection, and follow the road into Lynn Valley park. Park your car as close to the concession stand as you can. This is close to the entrance to the Suspension Bridge. The Bridge is just past the Totem pole you will see next to the parking lot. If you are in reasonably good shape, you can cross the Suspension Bridge and continue on down the trail on the other side to your right, and then cross back again on the standard bridge at the bottom of the Canyon. Here, in good weather is a beautiful green pool. You will usually see teenagers jumping off the bridge and cliffs into it. After crossing the bridge you can proceed up the other side, following the river until you reach the parking lot. Its quite a steep climb, but there are stairs. From Lynn Canyon, exit back out again onto Lynn Valley Drive. Follow it back to the Freeway, head westbound and follow the signs back to downtown Vancouver. Proceed west on Georgia and into Stanley Park. remain on the Causeway and cross Lions Gate Bridge. At the end of the bridge, do not exit, the road will curve to the right and then pass underneath the bridge. Proceed west on Marine Drive. Simply stay on Marine drive for several miles as it first passes through West Vancouver proper and then curves its way along the waterfront with its multi-million dollar homes. Keep your eyes open for Lighthouse Park on your left. If you have never seen giant trees, this park is full of them. You can see several examples in only a 10 minute walk from the parking lot, so you don't have to dawdle here too long. Marine Drive eventually ends at Horseshoe Bay. At the end of the road, turn right across the bridge, then left onto Highway 99. Highway 99 is one of North America's most scenic drives. Unfortunately the viewpoints are all on the wrong side of the road and it can be dangerous to cross the highway to get at them. Its best to stop at them on your way back when they are on the right side. About 30 minute drive on, you will come to the village of Britannia Beach. This used to be one of the largest copper mines in North America, and you can take a tour of them if you wish. These mines are also the site of several X-File episodes. A tour will take 1 to 2 hours depending on your timing. Another 20 minutes on, watch for the sign for Shannon Falls on your right. These are one of the worlds highest and are especially spectacular in the spring. It will take you about 20 minutes to walk to the falls and back from the parking lot. At this point you can either continue on to Whistler, about an hour further up the road or start heading back. If you do continue to Whistler, be sure to stop at Brandywine falls, located on your right about 6 miles before Whistler. These are a 10 minute walk from the highway. Returning along Highway 99, this time stay on the freeway when you reach Horseshoe Bay. Keep your eyes open for the exit for the Cyprus Bowl, Hollyburn Ski area. Exit here and proceed up the mountain to the first switchback. Located here, is a viewpoint with an excellent view of Vancouver. There is no point in continuing further up the mountain. Return to the freeway and follow the signs back to downtown. Follow the instructions in Drive 3 above, as far as Whistler, you still have time to visit the attractions mentioned on the way, provided you make an early start (8 AM or earlier). You can afford an hour or 2 in Whistler., as long as your back on the road by about 1 or 2 PM. Drive north to Pemberton. Continue to the high desert country at Lillooette, and then take Highway 12 to join Highway 1 at Lytton in the Fraser Canyon. (Be careful at Pemberton, the turnoff to Lillooette is easy to miss and you can end up on the Anderson Lake road by mistake. There is a General Store at the junction, stop and make sure you are in the right place. ). By the way, on the road from Pemberton to Lillooette there is a small lake on the right about 1/2 mile off the road at about the half way point. Its well past the large lake the road parallels and past the long series of switchbacks. I can't remember its name, but keep a watch out for the brown warning sign. Its one of the prettiest lakes you've ever laid your eyes on, back-dropped by a glacier. Put lots of bug spray on, though. Stay in the Town of Lytton overnight. This is the hottest place in Canada (in summer), so make sure you have Air Conditioning. Here is your opportunity to River raft. Fraser River Raft Expeditions offers one day trips down the Thompson River which has class 3 & 4 rapids. You can choose the large pontoon boats which have no chance of flipping or the more exciting small rafts you paddle. My 75 year old mother in lkaw even did that, although she is not your normal 75 year old granny. They operate May through September. They meet at Lytton (how convenient) then bus you up to the town of Spences Bridge. You spend the day rafting back to Lytton. You must pre-book. You get back just before 4 PM and this gives you time to drive back through the Historic Fraser Canyon (while its still light) and then the Freeway from Hope back to Vancouver. If its still light when you get to Hope, take a 15 minute trip (each way) east on Highway 3 to see the spectacular Hope Slide. During the 60's, an earthquake caused half a mountain to slide into the valleys, burying the highway and several cars in the process. Fortunately, it happened in the middle of the night. Its quite a sight, and the foliage has not come back, so it looks much as it did 35 years ago. The Hope slide, 18 kilometres east of Hope, was one of the largest slides in Canadian history. 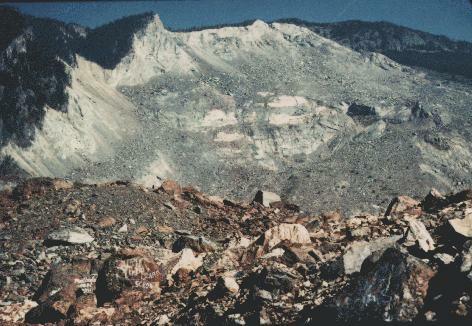 The southwestern slope of Johnson Peak, collapsed on January 9, 1965, spreading 47 million cubic metres of debris, 85 metres thick, over a 3 kilometre stretch of the Hope-Princeton highway. The slide occurred in an unpopulated area in early morning hours and resulted in four deaths (photo courtesy of the Ministry of Environment, Lands and Parks). If you do not want to raft, you can either take a leisurely drive back to Vancouver through the Fraser Canyon, or take the long way. To do that, Continue from Lytton to Merrit, then take The Okanagan Connector to the Highway 5A turnoff and head south down Highway 5A (very pretty with lots of lakes) to Highway 3 at princeton. Take Highway 3 West back to Hope and then the Freeway to Vancouver. This is a full day. If you choose to go through Fraser Canyon, make sure you take a side trip from Hope about 15 minutes along Highway 3 to see the Hope Slide. 1) Cross over the Lions Gate Bridge from Downtown and take Highway 99 north along spectacular Howe Sound to Squamish, Whistler and Pemberton. Continue to the high desert country at Lillooette, and then take Highway 12 to join Highway 1 at Lytton in the Fraser Canyon. Turn north on Highway 1 to the desert town of Cache Creek. (Highway 12 is subject to slides, if it is closed, there is an alternative route from Lillooette to Highway 97, just north of Cache Creek) This is a full long days trip from Vancouver, including stops. (Be careful at Pemberton, the turnoff to Lillooette is easy to miss and you can end up on the Anderson Lake road by mistake. There is a General Store at the junction, stop and make sure you are in the right place). 2) Take Highway 1 to Kamloops and then turn north on Highway 5 to Clearwater. At Clearwater, take a side trip into Wells Gray Park to see the spectacular Helmekin Falls. Continue north on Highway 5 to Valemount. This is another days drive. 3) Just north of Valemount, turn east on Highway 16 at Tete Jaune Cache. The drive to Jasper, Alberta takes you past Mt. Robson, the highest peak in the Rockies. At Jasper, turn south and follow the scenic Jasper-Banff highway to Banff. Assuming, you don't spend any time in Jasper, this is another days drive. Head east to Calgary or continue back to Vancouver. 4) From Banff head south on Highway 93 to Radium Hot Springs and then south on Highway 95 to Cranbrook. It is worth stopping at both Radium and Ft. Steele. Including stops this is a days drive. 5) From Cranbrook, continue south on Highway 95, and then west on Highway 3 to Creston. At Creston head north on Highway 34 to Kootenay Bay. Here you cross Kootenay lake on a free ferry. Head north on Highway 31 to Kaslo and then on 31A to New Denver and Highway 23 to Nakusp. Another days drive with views of Lakes and Glaciers. 6) From Nakusp, head south on Highway 6 to Fauquier and cross Arrow Lake on another free ferry. From Needles on the other side, follow Highway 6 to Vernon in the Okanagan Valley. Another days drive. 7) From Vernon, head south on Highway 97 to Kelowna. You will want to spend a day along this short stretch, swimming or visiting vineyards. Continue south to Penticton if you like, but I would recommend retracing back up Highway 97 to the junction with Highway 97C just north of Peachland. This is another days journey. 8) From Penticton you can take Highway 97 and Highway 3A to Keremeos and then Highway 3 to Princeton, but my personal preference is to take the junction just north of Peachland which is Highway 97C. This 85 km stretch of Highway is very boring, but it takes you to Highway 5A (if you hit a 2 lane stretch, you've missed the junction). Highway 5A, takes you south to Princeton and is one of the prettiest stretches of road in BC, with picture perfect Alpine lakes. From Princeton, take Highway 3 to Hope (make sure you stop at Lightning lakes, described above, and at the Hope Slide) and then head back to Vancouver. As an alternative at Hope, you can head a short way up Highway 1, until you cross the Fraser River and then take Highway 7 back to Vancouver, a scenic alternative to the Freeway. This is a long days drive from the Okanagan.